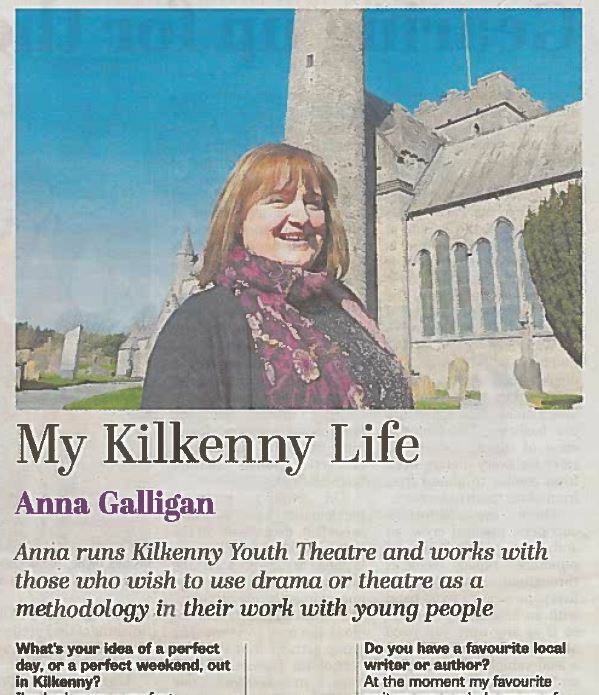 Name: Anna Galligan, Outreach Officer Barnstorm Theatre Company. 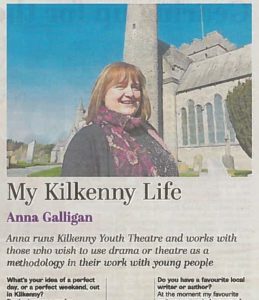 Anna runs Kilkenny Youth Theatre and works with those who wish to use drama or theatre as a methodology in their work with young people. She resides in Kildare and has worked in Kilkenny for over eight years. What’s your idea of a perfect day, or a perfect weekend, out in Kilkenny? I’ve had many a perfect weekend in Kilkenny, because it usually consists of booking into one of the marvellous hotels, having a swim, hanging out with the family and then eating in one of the great restaurants in the city. For days out, I love bringing the kids down to Castlecomer Discovery Park. And then we usually head over to the Reptile Zoo – my son is on first name terms with the snakes and turtles down there. On a sunny day, I like to get out of the office, wander through the city centre to the Castle park, get an ice-cream and sit and watch the world go by. Who has made the greatest contribution to Kilkenny in your lifetime? I know it is not a specific person, but I have huge respect for those involved in the arts in Kilkenny and in particular those who support arts participation. On the first week of work here in 2009: driving along the very narrow lanes around St. Canice’s Cathedral up to Barnstorm Theatre Company, holding my breath and hoping that no-one would come in the opposite direction! Eight years on, it’s no bother at all. What’s your favourite part of the county — and why? There are many beautiful places around Kilkenny but I do spend the majority of my time in the city centre. One of my favourite places to sit outdoors on Kieran Street, cappuccino beside me, watching the world go by and listening to the sounds of the medieval city. I grew up in Dublin and now I live in Kildare town so I love this city time during the week. At the moment my favourite writers are a whole group of young people I work with: Kilkenny Youth Theatre, because they are currently devising their next show so, though it is not writing in the traditional sense, there will be a script at the end of the process. This is the first time we have devised from scratch so it is both exciting and terrifying. We are half way through the process and it is really a credit to them all how far this new play has progressed. What about a favourite local walk — or view? I love walking from Barnstorm, down High Street and on to Butler Gallery during the Kilkenny Arts Festival. There is always such a nice buzz around the city. It has to be its city centre. The mix of independent shops, medieval architecture, historical markings, small traders and relaxed feel is unlike any other city in Ireland. Keeping Kilkenny City alive and well with its independent traders, coffee shops and businesses must be a challenge. So many cities, and even towns, have lost their identities to consumerism and the encroachment of chain stores and global companies. I would love Kilkenny to have its own third level education institute. It would be great if those who wanted to attend college or university had the option of studying in their own county.